I would have given this audiobook 5 Stars only if it comes with the PDF Transcript - as my device cannot get the transcript downloaded into my computer so that I can read the transcript while I am listening to the book, or at least, give the customers a Link where we can read the transcripts. Thank you ! The same applied to other books - NO PDF available. 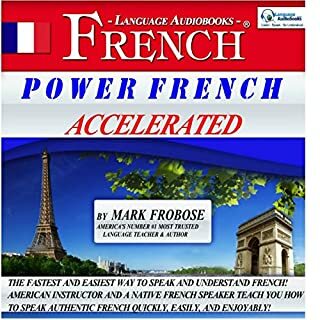 I loved Power French 1 and found it to be amazing because I actually learned to speak and understand a huge amount of French from it. 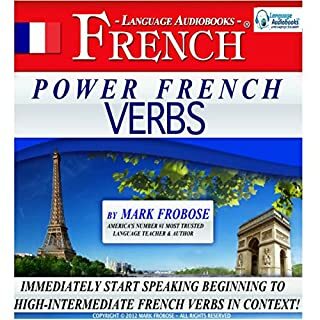 I expected Power French 2 to be a bit of a “letdown” but was pleasantly surprised to find that it’s every bit as effective as Power French 1. This system seems to be designed so intelligently that even small amounts of grammar, common words and phrases, can all be used in different orders and sequences (you get to pick the sequence – that’s the cool part) and you come off sounding like you’ve spoken French for years. It’s like “Cliff Notes” on steroids for wannabe French learners. Power French 2 is so intelligently organized that even the smallest addition of new vocabulary, a phrase or a new verb greatly magnifies your fluency. I am amazed at the simplicity of Mark Frobose’s approach, and I applaud him for the fluency in French that I am finally reaching. I suggest beginning with Power French I Accelerated before attacking Levels 2 and 3. “The intelligent and efficient organization of French, presented in an interesting and engaging fashion, designed to stimulate within the listener, original and spontaneous French fluency and using only the most useful words, phrases, expressions and tenses in a fun, non-grammatical way”. It’s tough to do this excellent program justice, but I just tried. In plain English …. It’s a heckuva great program and it has pushed me towards near-native fluency in French. What I really like about Power French 2 is the clear presentation. In fact, the entire Power French 2 program is so intelligently organized that even a small amount of intermediate French vocabulary can be used to speak hundreds of sentences that you create yourself. This gives great confidence to continue learning. The native French speakers that I work with think that I'm in some kind of high-priced language school because my French is now sounding so good and natural. Power French 1 really worked for me. Now Power French 2 is a clear winner. I'm looking forward to getting Power French 3 once I've mastered all of this great material. I haven’t spoken FRENCH for almost 35 years, until recently required to do so in a new job. Mark Frobose’s Power FRENCH 2 Accelerated Intensive Audio Instruction has proven to be the perfect tool to quickly revitalise my ability to understand and speak French. I recommend the Frobose French series to anyone in a similar situation. In fact, I wish I had had the Frobose audio recordings when I was starting to learn French years ago. The teaching method of combining a native English speaker with a native French speaker in rapid, repetitive succession focused on specific learning goals is perfect for my needs. French is one of six languages that I have needed to learn during my career. Shifting gears between languages can be very difficult, especially after years of disuse. The Frobose method of instruction makes it so quick, easy and fun to re-kindle one’s ability to speak a language that it’s almost like magic. Now that I am aware of the audible set, I am happy to recommend it to others. 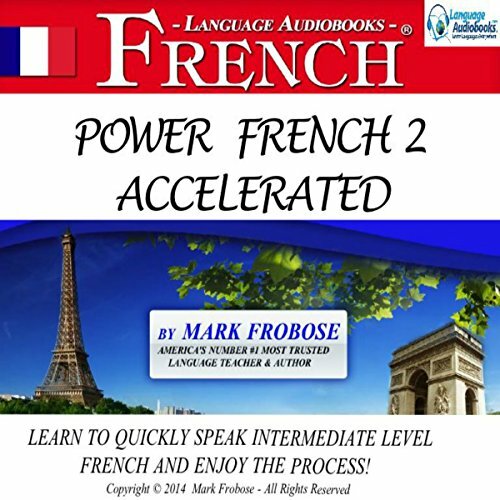 Where does Power French 2 Accelerated rank among all the audiobooks you’ve listened to so far? I moved to France without speaking French, and have learned experientially. This book was a great complement to use on the go. Mark does an excellent job of bringing in and repeating new ideas in a way that's engaging and interesting. I looked forward to listening to this again, and have enjoyed bringing new words into my French conversations with friends! What would have made Power French 2 Accelerated better? 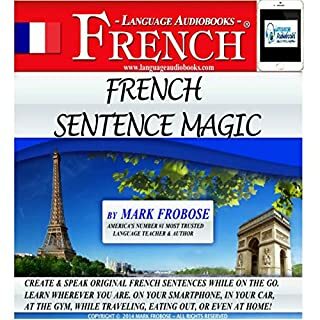 Because this book centers on colloquial and slang French, which most learners are not familiar with, listeners really need a PDF so that they can study the words and phrases. without a PDF, which facilitates memorization of phrases and spellings, the heard phrases just slip in and out, no matter h ow many times repeated. Would you try another book from Mark Frobose and/or Mark Frobose? Organize the recording so it's not as repetitive. It overlaps his first tape and then repeats the same exact lesson several times. I agree with the reviewer who said it's all over the place. I now am listening to his driving audio and it is much more information. Not repetitive at all. If I want to repeat something I can rewind. What does Mark Frobose bring to the story that you wouldn’t experience if you just read the book? An accompanying pdf would help.